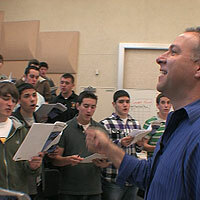 In this segment, Spark visits the San Ramon Valley High School Concert Choir as they prepare pop, classical, and folk selections for their 2010 spring concert. Choir director Ken Abrams, who stresses music theory and comprehension, leads this 82-member chorus. Visit the San Ramon Valley High School Concert Choir as they prepare for their 2010 spring concert.